The event was organized by the European Commission DG Justice and the Slovak Presidency of the Council of the European Union from 9-11 October 2016 in Bratislava. 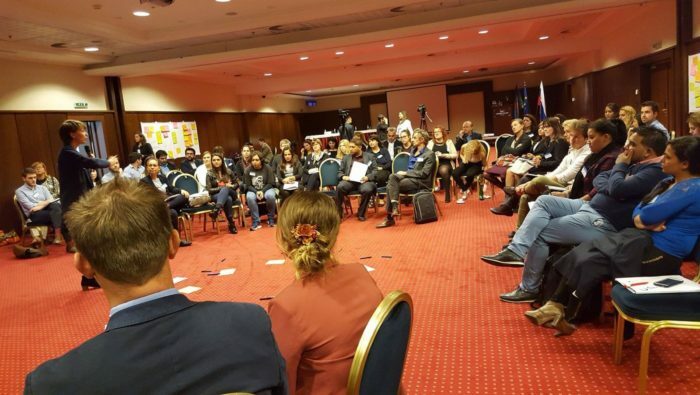 The aim of the event was to bring together young Roma and relevant stakeholders to work together on how they can be a driving force for the Roma integration process. The event also included the first year of the European Roma Spirit Award 2016, which awards exceptional individuals, organizations, and projects who actively improve the situation of Roma in Europe every day. The agenda of the event was very intense with panel discussions and workshops with high-level representatives such as Commissioner Jourova and representatives of the Ministries from Slovakia, Czech Republic, Romania, and Hungary. Moreover, representatives of the Council of Europe, Members of the European Parliament and international and national stakeholders who work on Roma integration were present at the meeting. ERGO Network took part in a workshop on access to social rights with a focus on education and employment. The outcome of the workshops was a common agreement that antigypsyism is one of the main reason why the integration process of Roma and Roma youth is still a major issue after so many measures were taken. The outcomes of the workshops were presented by young Roma rapporteurs and discussed in the panels. In the panel discussion “Roma Youth as the Leaders of the Roma Integration Process” with the ministries and high level representatives, Valeriu Nicolae, Special Representative of the Secretary General for Roma Issues from the Council of Europe, said “Racism goes beyond the logic and destroys lives; we must take action and stop antigypsyism”.